At eloomi, we onboarded our own new-hires within our platform in just two weeks by using a process that helps the individual perform and develop faster. The approach we used helps the individual perform and develop faster while kicking off a successful employee experience. I asked eloomi’s Head of People & Culture, David, how eloomi onboards new hires as an integrated part of their workflow and why that is essential now. Interview with David Schou-Elsass, Head of People & Culture in eloomi. How can new employees be onboarded so fast and what is the thinking behind this? I think we need to radically change how we, as HR professionals, contribute to the success of the company. Josh Bersin, a prominent thought leader from Deloitte, is very precise when he states the role of HR today. We need to stop interrupting people and make their work easier, more productive and more meaningful. We see onboarding as the beginning of an employee experience, and this is key in how we work. It really starts in the pre-boarding, typically two weeks ahead of the employee’s first day at work. As a direct continuation of the hiring conversation, our new hires receive a personal welcome email and an online preboarding programme. The programme is a set of online intro and training modules in the eloomi platform where they meet their new leadership team in short videos, get an impression of the company culture and become compliant with the IT security policy. Online preboarding is valuable for new employees as it allows them to become familiar with the company, but the preboarding also creates tremendous value for the company. It delivers documented compliance and consistency as a part of the journey towards excellence. Instead of spending months on onboarding new people in the organisation because you think they need a lot of time to get ready, we’re showing our new colleagues that they are creating real value and that they belong in the team from the minute they start. David Schou-Elsass: Head of People & Culture in eloomi. How is online preboarding helping the employee? As a new employee, you are equipped with important knowledge that gives you a head-start in your new job. When you then show up on your first day at work, you meet the team, socialize and get a warm welcome. You truly experience that you are part of the team. The energy and drive you get from this as a new team member is immense. 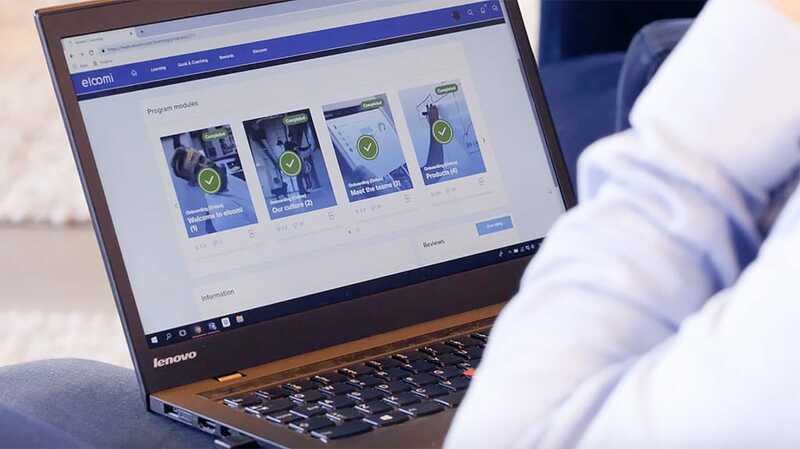 In eloomi, we use our online onboarding checklist with a template facility which gives us an overview of all the big and small activities to perform every time we onboard new staff. The onboarding process continues from our 12 new employees’ first day with blended learning activities that include online modules and onsite introductions and training. To secure a rewarding first employee experience we build up the learning process while continuously setting goals. We focus on the new-hires new roles and the capability for them to perform in their new positions. With the eloomi platform learning and training is easily integrated with goal setting and learning. What mission is driving our programme? What we see is that this approach makes new employees exceed our expectations. They learn quicker, perform in their new role and they produce quality work faster than we even dared to hope for. The 12 new team members we onboarded last month built up the competences they needed to start performing within the first two weeks. The onboarding process has a tremendous impact on the following employee journey, and how long the contractual relationship will continue. The sad truth is that 33% of new hires look for a new job within the first 6 months, which is bad business in all aspects. That is why onboarding, and the tools that make it successful, are a top priority for eloomi. eloomi has created a best in class online checklist for successful onboarding so we can be assured that we include all the key elements in the process. The checklist is easily integrated in the workflow and secures a rewarding employee experience. In the checklist we focus on four crucial phases in the employee experience: Preboarding,the first day, the first two weeks, and finally, we guide you to continuously evaluate the process. We all know that it is important to listen to employees, but if “listening” is not carefully integrated into the flow of work, important employee feedback can be lost. 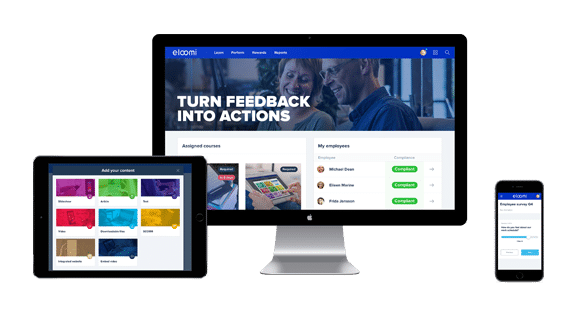 As a part of the onboarding process in eloomi each new employee gives feedback in a short survey, which is an integrated part of the eloomi platform and a facilitator to open communication. The survey gave us instant and valuable insights about how the process was helping our 12 new employees and what they needed to succeed in their new role. The survey allows for us to be agile, focus on the individual and stay clear of a one-size-fits-all approach that is not effective. During the onboarding process we define the new employee’s initial set of personal goals that guides them in the right direction. Setting goals is crucial for the new employees to feel aligned with what management is expecting. We find it equally important to initiate ongoing feedback & coaching during the onboarding as part of our culture. As a supplement to the employee-manager dialogue, you can check in with HR on a day-to-day basis. We put emphasis on giving the individual the support they need and remove obstacles that are preventing them from moving forward. Instead of spending months on onboarding new people in the organisation because you think they need a lot of time to get ready, we’re showing our new colleagues that they are creating real value and that they belong in the team from the minute they start. I think our HR strategy is successful because we have a very practical approach to employee experience and we design solutions that empower individuals. How does the practical approach to the employee experiences align with performance culture? We have realized the importance of integrating the HR processes in the right sequences and moments of the employee experience. If you get something from HR and you think “how am I going to find time for this?” then we’re on the wrong path. HR is not here to make you look away from what you’re working on and do things you perceive as irrelevant. There’s enough already in modern worklife that’s distracting you. We’re here to help you make your work easier, make you feel well informed and ready for a new exiting journey where you can grow as an individual. eloomi’s preboarding and onboarding programme reduced the time from contract to performance when we welcomed 12 new hires last month. 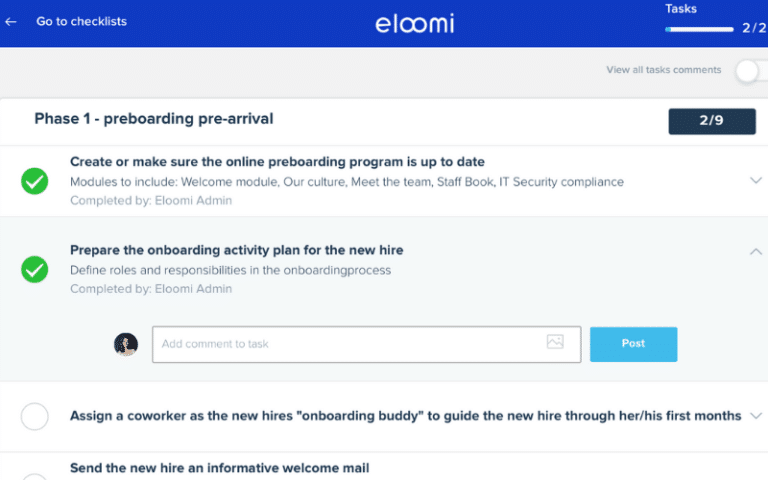 With the eloomi platform, we were able to customize an ideal onboarding process for our new hires. The platform made it easy to maintain goals and support ongoing conversations between the manager and the new hires with online surveys, and HR is supporting with coaching on demand. The valuable learning path initiated a successful employee journey for our 12 new hires with eloomi. Interested in updating your company’s onboarding? PrevWhat’s in This for the Business?